What's More Scary, Ebola or Deflation? Deflation is a generalized decline in prices and, sometimes, wages. Sure, if you’re lucky enough to get a raise, your paycheck goes further–but those whose wages decline or who are laid off or work fewer hours are not going to enjoy a falling price index. Here's what I think Wessel might be trying to say. Imagine a Woodford cashless world in which money serves only as a unit of account. As well, there are no sticky prices or sticky wages, but suppose there are labor market frictions, so that there is always some churn in the labor market and some unemployment. In this world, the inflation rate does not matter. Wages, prices, unemployment insurance benefits, etc., are all indexed to the aggregate price level. That's a useful starting point. You can see that Wessel is a little confused though, as in such a world, there's really nothing to "enjoy" about deflation. We really wouldn't care. It can be hard (though, as we’ve seen, not impossible) for employers to cut nominal wages when conditions warrant; it’s easier to give raises that are less than the inflation rate, which is what economists call a real wage cut. And if wages are, as economists say, marked by “downward nominal rigidity,” then employers will hire fewer people. So, suppose that there is a sustained deflation of, say, -2% per year. Also, suppose that there is a law stating that no firm can reduce an existing employee's nominal wage rate. Question: Will that constraint bind in enough circumstances to matter in an economically significant way? Answer: Probably not. Why? First, on average, real wages increase over time with productivity growth. Of course, if we are experiencing productivity growth of 1% per year, and an inflation rate of -2% per year, average nominal wages should be falling at about 1% per year. But, supposing all workers are identical, it can still be the case that each individual living in this world can have an increasing nominal wage profile over his or her lifetime, since individual productivity can be growing at a much higher rate than aggregate productivity, as the individual gains experience (and thus accumulates human capital) over his or her lifetime. But individuals are not identical. People experience random shocks to their health that affect their productivity, and particular skills become more or less valuable in the market as technology changes and demand shifts among goods and services. So, if everyone were paid their marginal products, this would in general require downward nominal wage adjustments for some workers in the face of generalized deflation. But there are ways to get around a constraint on reducing the nominal wage rate for a given worker in a given job. It may be possible to adjust the worker's assigned tasks - i.e. change the job instead of the wage. Also, benefits can be adjusted. There is always job turnover, so it is possible for a given firm to adjust wages for its workforce through attrition. Further, of course firms are not literally constrained to refrain from downward nominal wage adjustment. In the face of a persistent deflation, it's straightforward for managers to point that out to workers - presumably most workers know what the CPI is. As well, firms that find ways to reduce nominal compensation where appropriate in the midst of a deflation will do better than those who don't, and most workers faced with losing their jobs or taking a nominal wage cut would choose the latter. So, I can't see that this is a serious problem. If a nonnegativity constraint on nominal wage changes were serious business, I think labor economists would be paying more attention to it. The fact that they don't is important, I think. As economic textbooks teach, the prospect that things will cost less tomorrow than they do today encourages people to put off buying. If enough people do that, then businesses are less likely to hire and invest, and that makes everything worse. If people actually put this idea in textbooks, that is a bad thing. It's certainly not in mine. See my comment on #1. If deflation is just a sustained decrease in the unit of account, and nothing else, then it can't have any consequences for consumption/savings decisions. To say something about that we have to go more deeply into what is causing the deflation, its effects on rates of return on assets, etc. #3 makes no more sense than to say that there will be higher consumption and lower savings if the inflation rate is 5% rather than 3%. It's not clear why. Unfortunately, Wessel does not make clear the difference between anticipated deflation and unanticipated deflation. #1 through #3 seem to be about anticipated deflation, while #4 is about unanticipated deflation. Most debt contracts are written in nominal terms, so if the inflation rate is lower than anticipated, this will redistribute wealth from debtors to creditors. The debtors are not actually "forced to cut spending." That might be one margin on which to make adjustments, but debtors might also work harder, or default on their debt. Does this redistribution of wealth just net out in the aggregate, as the creditors are better off, and will consume more, work less, and not be repaid if debtors default? Wessel invokes Irving Fisher to argue no, but I think the more important factor here - which Fisher never thought about, as far as I know - is the asymmetry due to bankruptcy costs. In contrast to inflation that is higher-than-anticipated, lower-than-anticipated inflation induces more bankruptcies, and the ensuing bankruptcy costs are a net loss to society. That could be important. But note that this is not particularly associated with inflation going into negative territory, but simply a feature of disinflation in general. But, note that the disinflation that occurred between 1980 and 1985 was in the neighborhood of 10 percentage points, depending on the inflation measure we look at. That experience was of course associated with a severe recession, but the U.S. economy bounced back quickly - no signs of a "bad downward spiral." So if central banks fall short of 2% inflation targets by one, two, or three percentage points, that doesn't seem like such a big deal. I'll discuss Japan below, but I don't think that's quite the unanticipated disinflation experience Wessel is looking for. If there’s 4% inflation, a zero interest rate works out to a -4% real (or inflation-adjusted) rate. At no inflation, a zero interest rate is, well, zero. And with deflation, a zero interest rate is a positive real rate. Deflation just makes all this harder to do. I think what Wessel is getting at is that, with short term nominal interest rates at zero, a central bank is limited in its power to raise inflation, if we think that the way to lower inflation is to lower the nominal interest rate. Actually, as I'll explain below, short-term nominal interest rates at zero have a lot to do with why inflation is low in the world, as Irving Fisher (who Wessel seems to approve of) told us. What causes deflation? Is deflation a good thing or a bad thing? It is now well understood that central banks can and should control inflation. So, if we observe low inflation, or outright deflation, this should have something to do with monetary policy. In standard monetary models, deflation can happen when the nominal interest rate stays at zero indefinitely. Indeed, a ubiquitous result is that a Friedman rule is optimal. Under a Friedman rule for monetary policy, the nominal interest rate is zero forever. Milton Friedman's argument was that a positive nominal interest rate represents a distortion. This distortion can be removed if the central bank acts to give money the same rate of return as other safe assets, which will typically imply deflation, at least on trend. So, theory tells us that deflation can be a good thing. If that is correct, then why do so many central banks think that 2% inflation is a good idea? Perhaps there are good reasons to have a positive inflation tax. Currency systems are costly to operate. It requires real resources to replace worn-out currency and prevent counterfeiting. As well, currency is used for various nefarious things - tax avoidance and illegal drug purchases, for example. So, maybe it is optimal to have positive inflation as an implicit tax on currency holdings. As well, it may not make much difference for long-run economic welfare whether the inflation rate is 2%, 4%, 0%, or -2%. But having a stable inflation rate is welfare-improving, as this minimizes the unanticipated redistributions between creditors and debtors that occur with unexpected changes in the inflation rate, as discussed above. To achieve a stable inflation rate, the central bank has to announce an inflation target, and then set policy in a way that achieves this inflation target, thus establishing credibility. If the central bank's inflation target is 2%, and there is persistent deflation, then deflation is bad because it undermines the central bank's credibility. Do we have any experience with economies that look more or less like Friedman rule economies? Japan, of course, is the standard - and only - example. 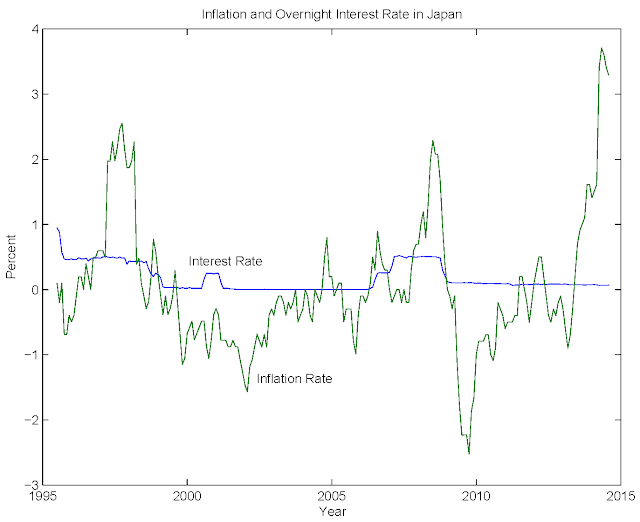 From mid-1995 to the present, the overnight interest rate in Japan has been below 1%, and for much of that period close to zero. Over this period there has certainly not been sustained deflation. If we confine attention to the pre-2014 period in the chart, the CPI inflation rate (year-over-year) has fluctuated between, roughly, -2.5% and 2.5%. The next chart shows the CPI level over the same period. This last chart shows that, at the end of 2013, the price level was about the same as in mid-1995, so the average inflation rate over the period 1995-2013 was about zero. 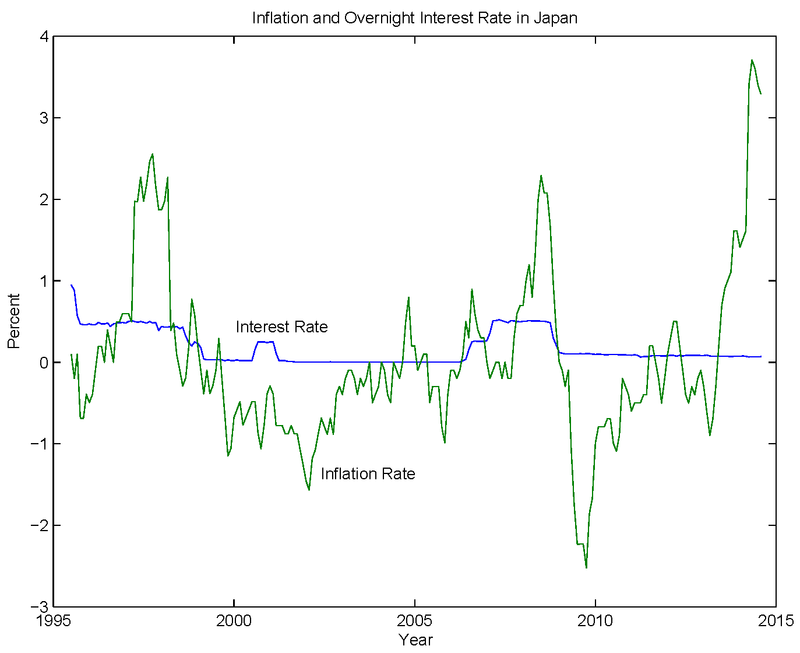 Thus, as far as experience in Japan tells us, if the central bank maintains the short-term nominal interest rate at close to zero for a long period of time, this produces volatile inflation, but not deflation (on average). Thus, the worry reflected in Wessel's piece concerning deflationary sprirals, or deflationary traps, seems not to be rooted in experience - or theory for that matter. 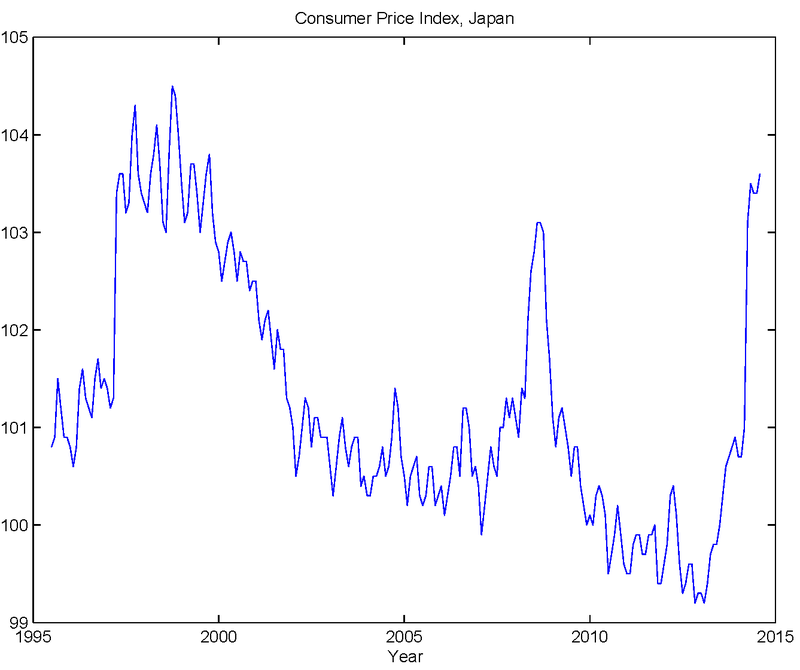 Wessel's concern of course was not specifically with Japan, but with recent low inflation as reflected in European consumer prices and world commodity prices. We could also add that recent inflation data has been on the low side in Sweden, Switzerland, the U.K., and in the U.S. What do all of these economies have in common with Japan during the period we examined above? Short-term nominal interest rates in all of these instances have been close to zero for extended periods. So what causes low inflation over long periods of time, and raises the possibility of deflation? Low short-term nominal interest rates over long periods of time. Why can economies get stuck at the zero lower bound (essentially) on nominal interest rates for long periods of time - or forever? Theory tells us something about this. Work by Benhabib et al. summarized by Jim Bullard shows how a central banker who conforms to the Taylor rule can cause the economy to converge to a zero-lower-bound steady state. The Taylor-rule central banker sees low inflation, and persists in trying to raise inflation by keeping the nominal interest rate at zero. But this only serves to maintain inflation at a low rate - in fact, there is deflation, in the framework considered. Effectively, in the long run the real interest rate is determined by factors outside the control of monetary policy, under any circumstances. But then, if the nominal interest rate is zero for a long time, the inflation rate will then be determined by those non-monetary factors. But what would be the harm in having a zero-lower-bound economy indefinitely? To answer this question, it's useful to look at the performance of the Japanese economy from 1995 until now. In the labor market, the unemployment rate was not indordinately high, ranging from about 3% to 5.5%. As well, the employment rate for people 15-64 is currently 3 percentage points higher than in mid-1995. What about real GDP and consumption? There has certainly been trend growth in real GDP and consumption in Japan since 1995, but the growth rate has been low relative to the United States. 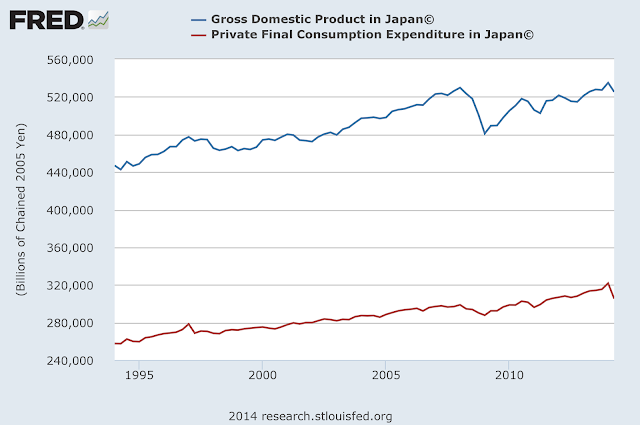 In Japan, average growth in consumption over the entire period was 0.8%, and average growth in real GDP was 0.9%. It's important to note, though, that demographic trends are much different in Japan than in the U.S. Since 1995, total population in Japan has been essentially flat, and the fraction of retired people in the population has increased. 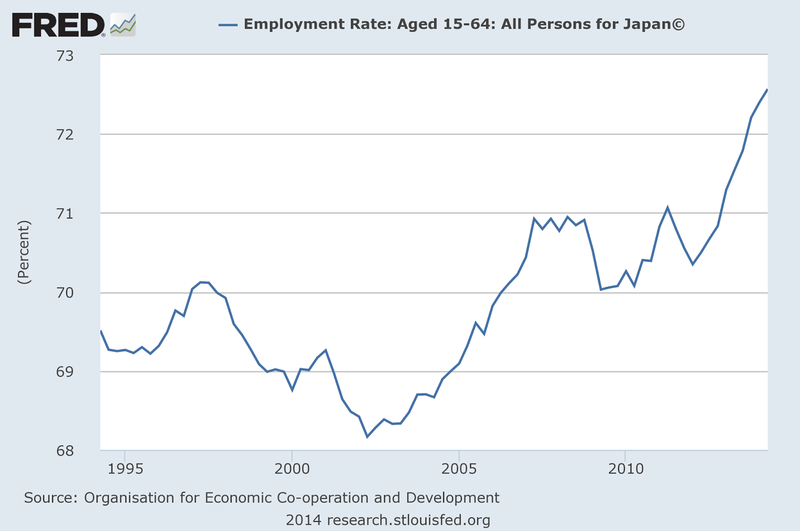 So in terms of per capita real GDP growth, this tends to push U.S. and Japanese experience closer together. To summarize some of the demographic effects in one measure, the next chart looks at average labor productivity (real GDP divided by employment) in the U.S. and Japan from 1995-present. 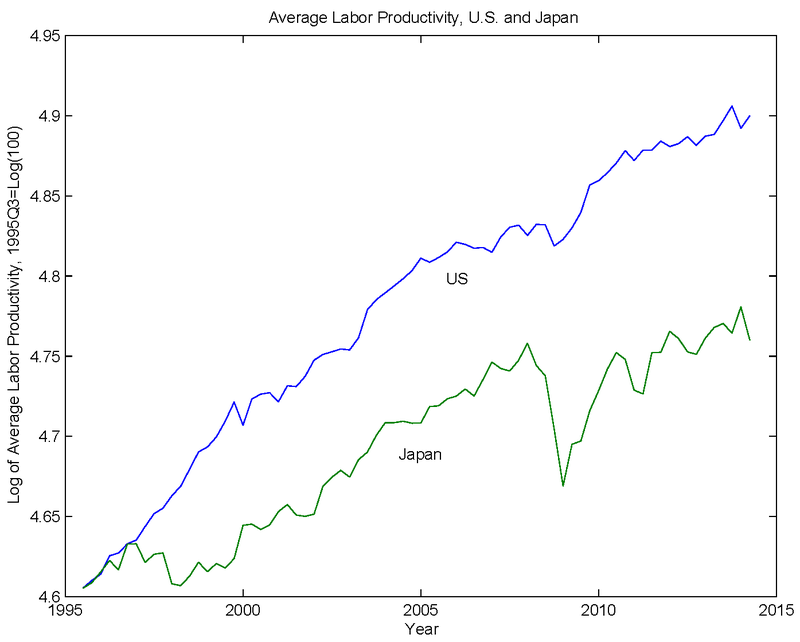 In the chart, I've normalized to make productivity equal in the two countries in mid-1995. You can see that the U.S. performed better over the whole period, but the better performance of the U.S. was over the period 1995-2000, and post-Great Recession (somewhat). Over the period from 2000-2008, productivity growth in the two countries was about the same. So, overall, real economic performance in Japan during the zero-lower-bound period was not a disaster, nor was it particularly good. It's hard to say, though, from this cursory evidence, that low or negative inflation had much to do with any substandard performance of the economy. What is clear from the zero-lower-bound Japanese experience is that inflation was quite variable, as shown in the first chart. Clearly, if the Bank of Japan was trying to stabilize the inflation rate over this period, it was not doing a a good job. But perhaps there are unconventional monetary policies that the Bank could have pursued that would have permitted it to do better. 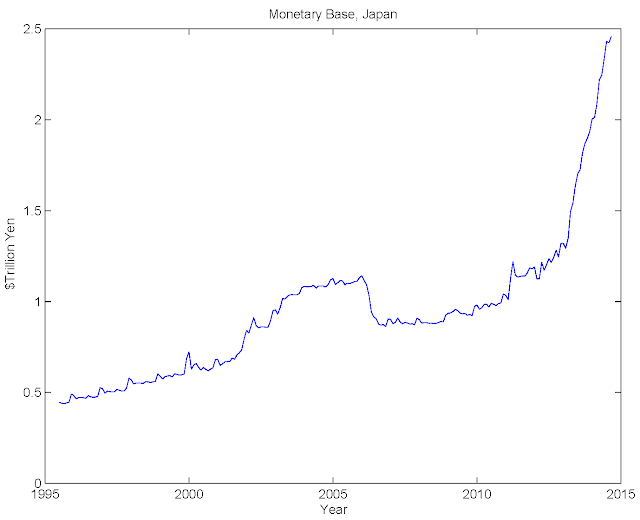 Indeed, in April 2013, the Bank of Japan embarked on a massive quantitative easing (QE) program. We can see the effects of that on the liabilities side of the Bank of Japan's balance sheet in the next chart, where we show the Japanese monetary base. The Bank introduced "Quantitative and Qualitative Monetary Easing" (QQE) in April 2013 to achieve the price stability target of 2 percent in terms of the year-on-year rate of change in the CPI at the earliest possible time, with a time horizon of about two years. Under the QQE, the Bank continues to pursue a new phase of monetary easing both in terms of quantity and quality. It will double the monetary base and the amounts outstanding of Japanese government bonds (JGBs) as well as exchange-traded funds (ETFs) in two years, and more than double the average remaining maturity of JGB purchases. 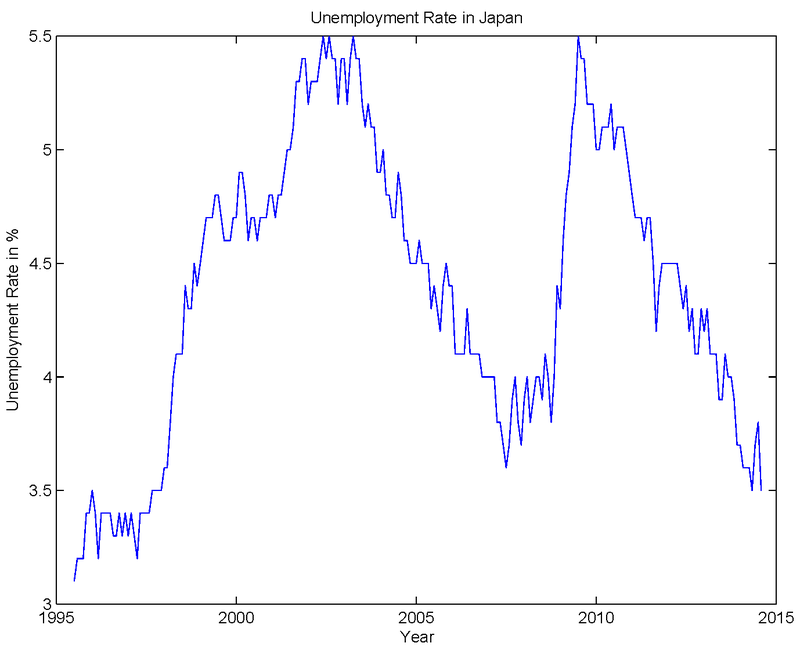 So, this makes it appear that the Bank of Japan should come close to meeting its target. 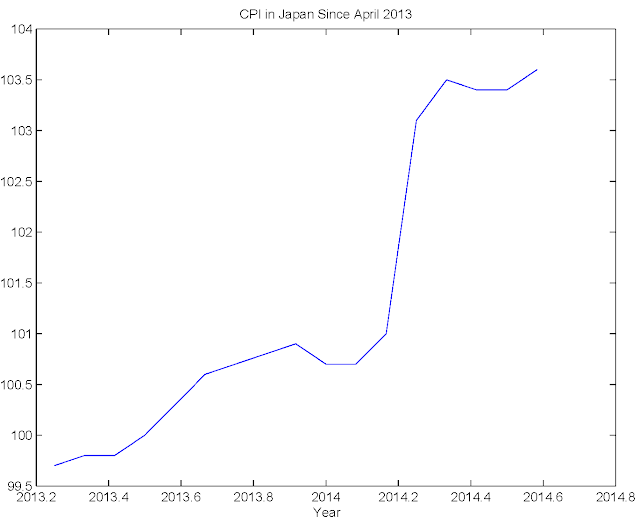 However, a large fraction of the increase in the CPI over this period is due to an increase from 5% to 8% in the consumption tax in Japan, which is effectively reflected one-for-one in the CPI. The tax increase occurred in April 2014, which you can readily see in the data. So, if we take out the effects of the tax increase, the CPI has been almost flat for the last year. 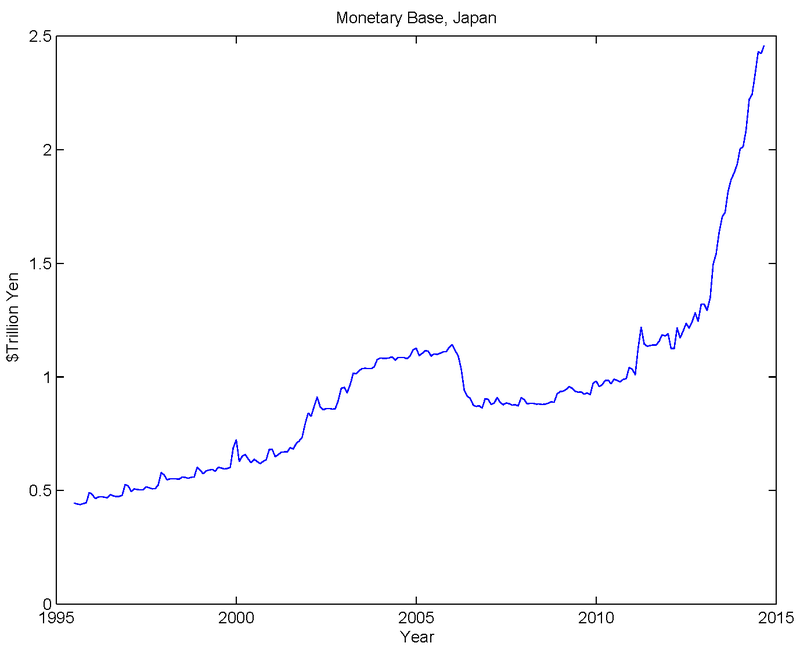 So, there is no evidence that QE has had the effects on inflation that the Bank of Japan would like. 1. The central bank will fail to meet a 2% inflation target, on average. 2. The inflation rate will be highly variable. 3. If the central bank is counting on QE to help it hit a 2% inflation target while the short-term nominal interest rate is at the zero lower bound, good luck.